Wolfberry Post! : JVL Advisors acquires common shares of Lynden! JVL Advisors acquires common shares of Lynden! It was announced today that JVL acquired an additional 3,389,100 shares of Lynden Energy from August 28 to September 11. It is also apparent that JVL must have been involved in the recent financing. JVL now owns 10,532,100 shares of Lynden! JVL Advisors is a great team to partner up with. A company like that would not buy into the private placement and continue to purchase shares in the open market without doing their due diligence and clearly they like what they see. John Lovoi, the founder of JVL Advisors, previously served as Head of Morgan Stanley’s Global Oil and Gas investment banking practice. With his experience in research and covering the oil industry, his due diligence must have concluded that Lynden is undervalued and worth backing. We are extremely excited at the prospects of having JVL Advisors as a large Lynden shareholder. Under John Lovoi, Morgan Stanley was a leader in oil and gas investment banking and mergers and acquisitions. He was “regarded as one of the most influential analysts in this sector and was well known for his stock picking capabilities.” For Lynden to be associated with JVL, this will undoubtedly open up many opportunities. 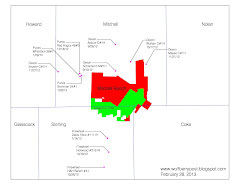 We view Lynden’s prospects as extremely bright, especially with all of the interest in Wolfberry and Cline Shale land. There are now open well permits in the vicinity of Mitchell Ranch and it appears the industry is testing wells in that area. With support of JVL Advisors, we believe that Lynden can realize its market cap potential and that this stock can return multiples.